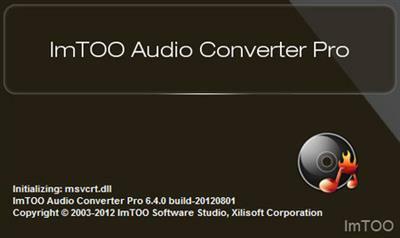 ImTOO Audio Maker is an all-in-one music converter and music CD burner to make music CD from music files such as MP3, WMA, WAV, M4A, AAC, MP2, AC3, and OGG, and extract audios from videos like AVI, MPEG, WMV, MOV, MP4, VOB, ASF, QT, 3GP, and RM. Audio maker is also a perfect music CD ripper to rip music CD/audio CD to MP3, WMA, WAV, APE, M4A, AAC, AC3, FLAC and OGG. 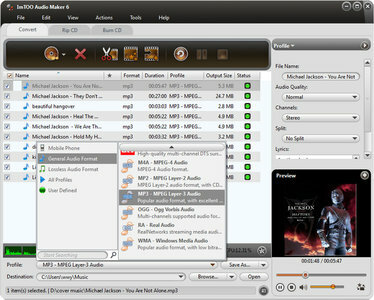 Assembling the functionalities of audio file conversion, audio extraction, CD ripping and CD burning in one tool, ImTOO Audio Converter Pro provides the most comprehensive solutions for music fans to transform between different audio formats, extract audio from popular HD and general video formats, rip CDs to music files and burn music CD from audio/video files.